Full measurement is 10” tall x 8” widest x 3-1/4” deep. Carving itself is 9-1/2” tall x 8” wide x 7/8” thickest. Full measurement is 14” tall x 9-1/2” wide x 3” deep. Carving itself measures 13-7/8” tall x 9-1/2” widest x 1” thick. Piece is curved. Detailed Alligator carved of woolly mammoth ivory, exquisite detail, carved in Bali. Measures 4-1/8” long x 1-1/8” wide x 1/2” tall. DETAILED Mama & baby polar bear (woolly mammoth ivory); note the foot detail; unsigned. Carved in Bali. Measures 2-5/8" long x 1-3/4" wide x 1-3/8" tall. Mammoth ivory, small buffalo is 1-5/8 long x 3/8 wide x 1 tall. Note even the cloven hooves are carved. Moose antler, Large buffalo is 2-7/8 long x 1 wide x 1-7/8 tall. Cloven hoof bottoms also carved. Moose antler, Large buffalo is 3 long x 7/8 wide x 2-1/4 tall. Cloven hoof bottoms also carved. Medium sitting cat, moose antler, 1-15/16” tall x 1-1/8” wide x 1” deep; note paws are detailed. Medium dog, crouching to play (Labrador type of breed), Moose antler, 2-1/2” long x 7/8” wide x 1-1/4” tall, note foot pads are detailed. Medium dog, crouching to play (Labrador type of breed), Moose antler, 2” long x 7/8” wide x 1-3/8” tall, note foot pads are detailed. Medium dog, crouching to play (Labrador type of breed), Moose antler, 1-3/4” long x 7/8” wide x 1-1/4” tall, note foot pads are detailed. Three frogs and water lilies on a half round of fossil mammoth ivory tusk. Carved in China, signature in Chinese on reverse. Measures 2” tall x 1-7/8” wide x 7/8” deep. Measure 2” long x 1-1/8” wide x 5/8” tall. Even the underside of the base is carved. 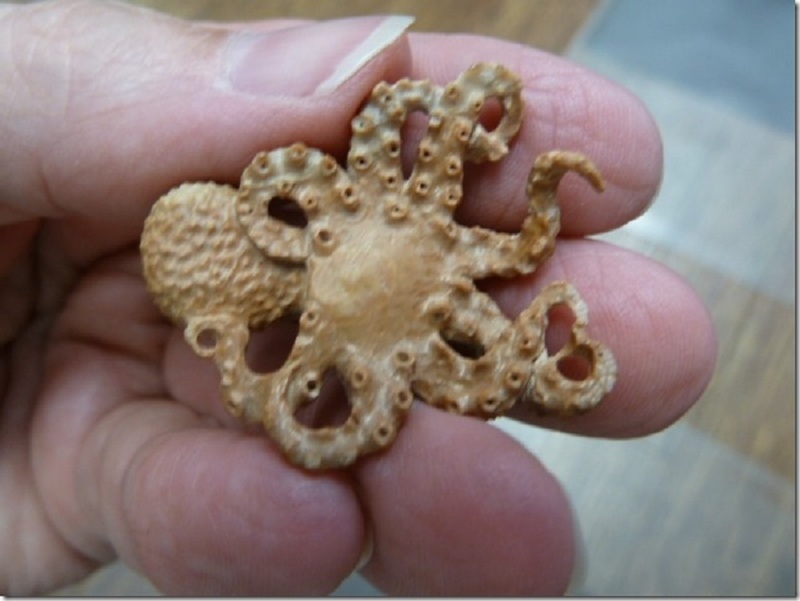 Octopus itself is 6-3/8” long x 1” wide at the head x 2-5/8” tall. Full carving + base is 7-1/4” tall x 2” wide x 6-1/2” long.